Here’s the 411 on MINDCAGE. Hailing from Florida, this band is set to make a BIG NOISE in the world of metal. Not just progressive metal, but ALL metal. Sure, the requisite influences are easily heard in the music and vocals (early QUEENSRYCHE, FATES WARNING), and vocalist Jeff Hignite sounds a LOT like Geoff Tate (when he could still sing worth a damn) at times, but is that really a bad thing? Hell no! 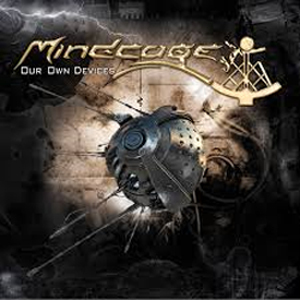 Formed in 1996, MINDCAGE began as the brainchild of founder and lead guitarist Dietrick Hardwick. They’ve released their debut album Our Own Devices via Kinematic Music and to be honest, I was on board after one song. Originally released last year, there is now a special edition of Our Own Devices due out this summer. This special edition will include exclusive, never-before-released live footage from the band’s headlining performance at this year’s Florida-based Comic Con event, Pensacon. Set in a dystopian society, this is a classic tale of a hero (or in this case, heroine) named Arabella Vash who will rise against the oppressors. I mean, who doesn’t love this kind of story? And quite frankly it’s been a loooong time since I heard a concept album that didn’t make me want to jump off a building. The guitars crunch, the solos are fluid. The drum sound is crisp and clear, and the vocals soar. The production on this record is stellar, and balances all these things perfectly. Now…the songs: I’m not gonna go into a song-by-song breakdown. Why? Because it’s a concept album, silly. I want you to get it, and read the lyrics and figure it out for yourself, THAT’S why! My favorites are definitely “Our Own Devices”, “Firefly”, “The Human Race”, “The Serenity Sequence (Renaissance Part I)” and “The Grand Restoration (Renaissance Part II)”, this last one being the one I enjoyed most. Also, the storyline isn’t too vague, and it isn’t clearly spelled out for everyone, either. You have to do a little reading. Remember the days when we couldn’t wait to do that?? Arabella is voiced by HYDROGYN’s Julie Westlake, and she is nothing short of amazing. When she and Jeff duet I swear the hair on my arms stands up every time. Hardwick also serves up a ton of killer riffs and awesome solos on a silver platter, bassist Brian Howell holds down the groove and his rhythmic partner Craig Nudo plays with precision. Again, the sound on this thing is unbelievable, especially in my Trailblazer. In short, I found this to be an impressive debut from a band of seasoned musicians. I think MINDCAGE will gain fans not only in the prog-metal and musicians’ circles, but also in anyone who appreciates the classic works of IRON MAIDEN and JUDAS PRIEST. With Our Own Devices, MINDCAGE have managed to pay homage without ripping off, or sounding cheesy, and I am definitely excited to hear this stuff live. I highly recommend this one, guys. Pick up your copy of Our Own Devices in the KNAC.COM More Store right HERE.